To be fair the car has over 110K on it with a collision that set off the airbags, and it probably was originally bought well under the $17-19K sticker price. My TL-S is only worth 9k with 90K on the clock. That doesn't invalidate everyones comments though, it certainly suffered for being a fleet GM. 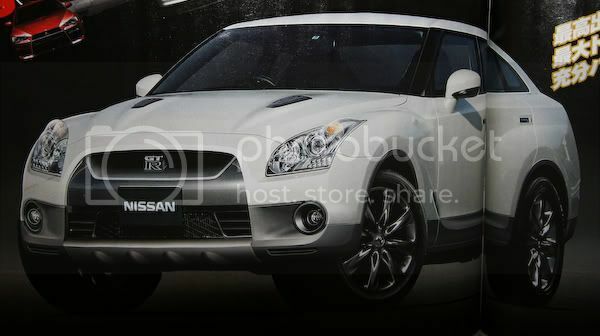 Nissan: SUV based on GT-R...? While new CAFE regulations will eventually force automakers to shift their SUV-heavy lineups, in today's market, SUVs are still some of the biggest profit earners. Because of this fact, some automakers best known for sports cars have entered the SUV market — such as Porsche with its Cayenne SUV. So if Porsche can make a successful high-performance SUV, why not Nissan? 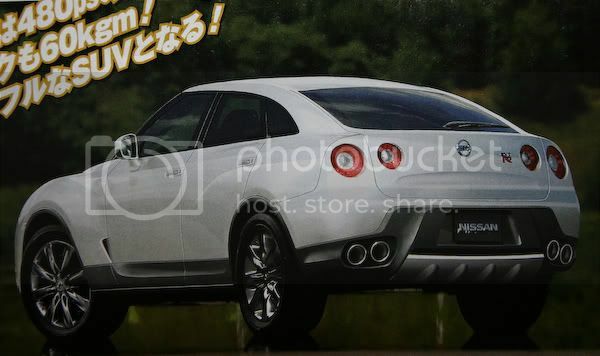 Japan's Best Car Magazine has published renderings of what a Nissan GT-R-based SUV might look like. While it remains unclear if Best Car created the pictures on insider information or just for speculation, the magazine reports that the SUV would use the same 480 horsepower powerplant found in the GT-R.
And if such a vehicle is under development — although there have been no indications that Nissan plans to produce such a vehicle — the Porsche Cayenne Turbo would be a likely benchmark, just as the 911 Turbo was a benchmark for the GT-R.
As unlikely as an SUV version of the GT-R seems to be, a four-door variation of the GT-R might be brought to fruition via an Infiniti model. Cuz, it's competing for the title of "Ugliest SUV" with the Porsche...? If it's competing with Porsche, then Nissan clearly won the ugliest title. Sure the Porsche SUV is meh...but this GTR SUV is horrible....it may even surpass the RDX.... RDX...worst name evar for a vehicle. RDX...worst name evar for a vehicle. It could have been worse....Acura Napalm anyone? Nissan didn't have anything to do with this; it's pure speculation from Best Car mag. I'd buy a 4 door gtr, but not that thing..
Don't give Acura any more ideas!!! hahahah, this is the most ridiculous photoshopped yet. you guys all have it wrong the BMW X6 is the ugliest SUV. i hope that there will be a 4 dr GT-R for the Infiniti division. maybe it can me an M3/M5 sedan fighter or a S4/S6 fighter? i really need to save that walk-in/walk-out smiley picture. And here i thought they would tarnish the GTR name. Talk about trying to milk a good thing. TOKYO (AP) -- Nissan Motor Co. will soon sell cars that push back when drivers try to put the pedal to the metal. The Japanese carmaker Monday announced its new "ECO Pedal" system, which makes the gas pedal press upward when it senses motorists are speeding up too quickly. Nissan (NSANY) said in a press release the system, which will be available next year, can help drivers improve fuel efficiency 5% to 10%. It calculates the most efficient rate of acceleration in a vehicle based on how fast fuel is being burned and other factors, and causes the gas pedal to push back to alert overzealous drivers. A special meter on the dashboard flashes and changes colors to help drive the message home. Nissan says the system is designed to help drivers become more fuel efficient behind the wheel. Part of the company's strategy for reducing carbon dioxide emissions is modifying driving behavior. what happened to self control? I can see the responses now. "Officer, the pedal was fighting me back, I had to push it hard." "We" will tell you how to drive. "We" know better than you do. Wow, that would be incredibly annoying. Could you imagine trying to accelerate onto the highway and the freaking car won't go because the gas pedal is fighting you??? "Drivers can also opt to switch the system off"
so its more like "we tell u what to do, if u want us to"